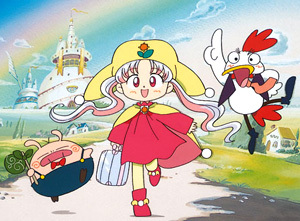 Yume no Crayon Oukoku (Crayon Kingdom of Dreams) is an anime series that ran from 1997-1999. It is based on a series of novels by Fukunaga Keizo. The civilians of the Crayon Kingdom have always viewed their Princess Silver as a twelve-year old girl with a beautiful smile. However, unknown to them, the princess has 12 bad habits. One day, a party is held to celebrate Silver's twelfth birthday. The princess is so busy trying to find a suitable dance-partner that she forgets to hide her bad habits. The boy she thinks suitable to dance with refuses to dance, and after a short quarrel, he changes Silver's parents, the King and Queen, into stone. Silver learns that only the Grim Reaper is capable of casting a spell like that, and she assumes that the boy was actually him in disguise. Along with a pig named Stonston and a chicken named Araessa, she begins a quest to find the boy Reaper. Animal Stereotypes: Stonston is a pig who's greedy and good at cooking. Cats Are Mean: Averted with Punya, Silver's kind and caring cat housemaid. Embarrassing Damp Sheets: The first part of the episode "The Sixth Month's Journey" reveals that Princess Silver is a bedwetter. Gotta Catch 'Em All: In an odd inversion, Princess Silver has to lose 12 things  namely, her bad habits. Magic Wand: Silver's Crayon Pen basically functions like this. Nice Hat: Silver has a floppy yellow cap. Raised by Wolves: Araessa is a chicken who was raised by a tiger. Sealed Evil in a Can: The Grim Reaper was trapped in a mirror by Silver's ancestor for several thousand years before the start of the story. Sheltered Aristocrat: Cloud is the spoiled and conceited variety. Spoiled Brat: Silver. It's one of her 12 bad habits. Taken for Granite: The King and Queen. Talking Animal: Araessa, Stonston, Punya, and others.